Q-Connect Drywipe Marker Pen Assorted (Pack of 10) KF00880 Pack of 1 Q-Connect Drywipe Markers. Xylene free dry wipe markers for use on Whiteboards. Low odour ink dries instantly yet can be removed easily with a dry cloth. Pack of 10 colours assorted. 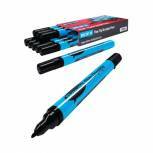 Q-Connect Drywipe Marker Pen Assorted (Pack of 4) KF26038 Pack of 1 Q Drywipe Markers. Xylene free dry wipe markers for use on Whiteboards. Low odour ink dries instantly yet can be removed easily with a dry cloth. Wallet of 4. Colours - Assorted. 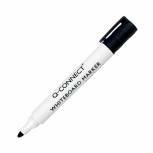 Q-Connect Drywipe Marker Pen Black (Pack of 10) KF26035 Pack of 10 Q Drywipe Markers. 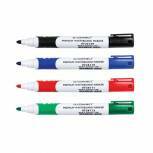 Xylene free dry wipe markers for use on Whiteboards. Low odour ink dries instantly yet can be removed easily with a dry cloth. Colour - Black. 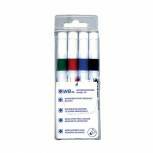 Bic Velleda 1701 Whiteboard Marker Bullet Tip Assorted (Pack of 4) 1199001704 Pack of 1 New alcohol based ink formula brings you low odour, leaves no marks when wiped out and bright colours. Conical design fits snugly in the hand for better writing control. Assorted Pack 4. (Chisel tip shown). 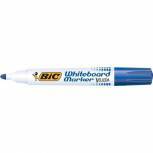 Bic Velleda 1721 Whiteboard Marker Fine Assorted (Pack of 8) 1199005728 Pack of 1 Fine tip whiteboard marker ideal for school and household use. 1.4mm line width. Alcohol based low odour ink. Wipes off easily even after a few days. Strong blocked nib. Assorted. 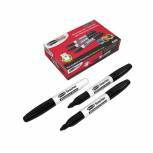 Show-me Drywipe Marker Medium Tip Black (Pack of 100) CP100 Pack of 1 Top quality dry-wipe pens designed specifically for educational use. 24-hour cap-off time to prevent drying out. Nib-stop to prevent tip from being pushed into the barrel if pushed too hard. Box of 100 in a black medium tip. 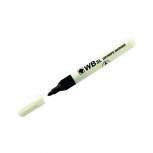 Black Whiteboard Marker Pens Bullet Tip (Pack of 10) WB15 804032 Pack of 10 Whiteboard marker pens. Bullet tip for constant line width. Writes on any dry-erase board surface. Chunky barrel for firm grip. Close-fit cap protects nib. Ink colour: Black. Pack of 10 pens. Q-Connect Drywipe Marker Pen Blue (Pack of 10) KF26036 Pack of 10 Q Drywipe Markers. Xylene free dry wipe markers for use on Whiteboards. Low odour ink dries instantly yet can be removed easily with a dry cloth. Colour - Blue. 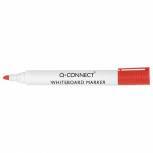 Q-Connect Drywipe Marker Pen Red (Pack of 10) KF26037 Pack of 10 Q Drywipe Markers. 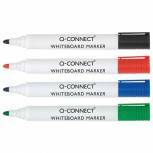 Xylene free dry wipe markers for use on Whiteboards. Low odour ink dries instantly yet can be removed easily with a dry cloth. Colour - Red. 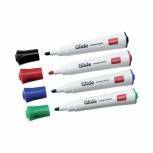 Nobo Glide Drywipe Marker Medium Assorted (Pack of 4) 1902096 Pack of 1 Bullet tipped Drymarker with an ergonomically designed barrel, integral ant-roll device to prevent the marker rolling off your desk and ink colour indicator cap. Assorted Colours - Black, Blue, Red and Green. 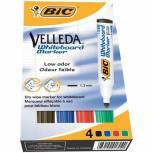 Bic Velleda 1701 Whiteboard Marker Bullet Tip Blue (Pack of 12) 1199170106 Pack of 12 New alcohol based ink formula brings you low odour, leaves no marks when wiped out and bright colours. Conical design fits snugly in the hand for better writing control. Blue Pack 12. (Chisel tip shown). Q-Connect Drywipe Marker Pen Green (Pack of 10) KF26009 Pack of 10 Q Drywipe Markers. Xylene free dry wipe markers for use on Whiteboards. Low odour ink dries instantly yet can be removed easily with a dry cloth. Colour - Green. 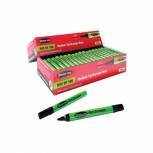 Show-me Teacher Drywipe Marker Black (Pack of 10) STM10 Pack of 10 Show-me teacher drywipe marker. 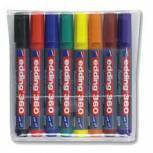 Full size drywipe markers, ideal for use by teachers. Bullet tip with xylene free, low odour ink. Ventilated caps for maximum safety. 24 hour cap off time to prevent drying out. Black. 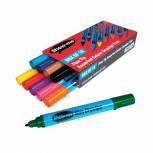 Show-me Drywipe Marker Fine Tip Black (Pack of 10) FPSDP Pack of 10 Slim Barrel Drywipe Markers. Fine nib for more detailed work. Slim barrel and easy fit lid are ideal for small hands. Pressure resistant and anti-splay nib. Xylene free, low odour ink. 24 hour cap off time. Colour: Black. 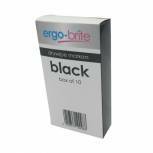 Ergo-Brite Drywipe Marker Rubber Grip Black (Pack of 10) JN10098 Pack of 10 Ergo-Brite Drywipe marker for planning and brainstorming. Can be removed easily from whiteboards with no more than a dry cloth. Comfort rubber grip on barrel for effortless writing. Bullet tip for precise writing. Black. Pack of 10 pens. Q-Connect Premium Whiteboard Marker Bullet Tip Assorted (Pack of 4) KF26113 Pack of 1 Q-Connect premium whiteboard marker bullet tip. Contains low odour ink. Features comfort grip on barrel for effortless writing. Gives longer writing length than previous models. Pack of 4 assorted colours. 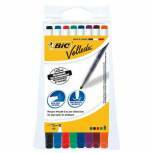 Bic Velleda 1701 Whiteboard Marker Bullet Tip Black (Pack of 12) 1199170109 Pack of 12 New alcohol based ink formula brings you low odour, leaves no marks when wiped out and bright colours. Conical design fits snugly in the hand for better writing control. Black Pack 12. (Chisel tip shown).